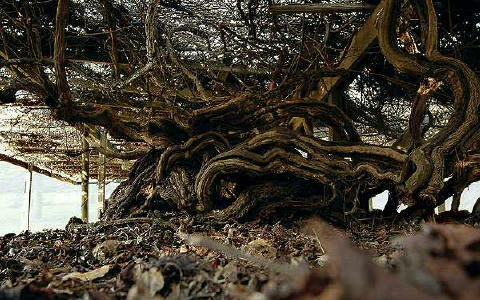 Roanoke Island in North Carolina is home to what is believed to be the oldest cultivated grape vine in the U.S. … and possibly the world. At about 400 years of age, it has withstood centuries of hurricanes, bugs, mildew and an inadvertent spraying with weedkiller in 2010. According to John Wilson whose family owns about half of the vine, it covers a quarter of an acre and two people embracing it would have trouble touching one another. At September Oaks Vineyards, we are branching out to develop wines from grapes other than Muscadine, but we will always honor the heritage of the Low Country, and the Mother Vine from which all cultivated Muscadines … including those in our own vineyard … originated.